With its central role in cell growth and energy production, vitamin B12 (also known as cobalamin) is vital to the functioning of every cell in the body. The importance of this vitamin means that B12 deficiencies can have wide-ranging and serious effects. 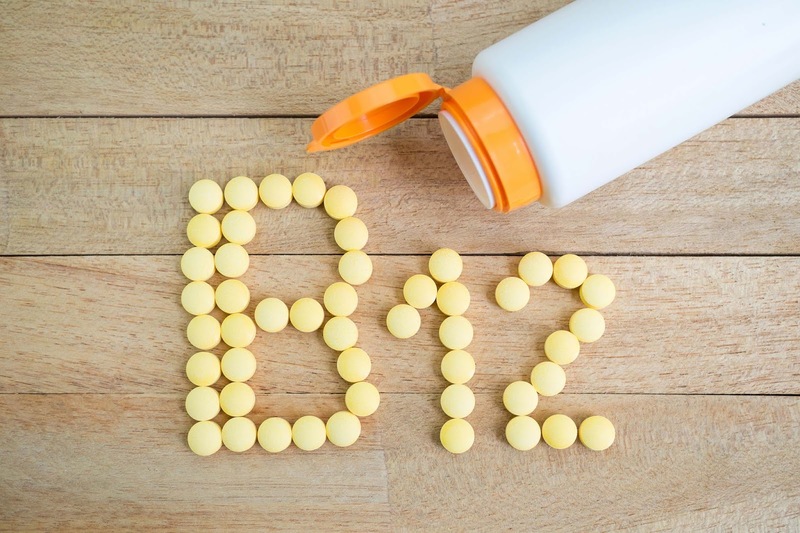 What Causes Vitamin B12 Deficiencies? Vitamin B12 is an “essential” nutrient; this is, it must be obtained from food because it cannot be produced within the body. In the standard human diet, the major sources of vitamin B12 are animal products such as meat, milk and eggs. Vitamin B12 deficiency can occur in the following situations. when there is too little B12 in the diet. This is most commonly the case in vegans, who do not eat any animal products. when B12 is absorbed poorly from the food in the digestive system. This has many possible causes, including lack of a substance called intrinsic factor, which aids B12 absorption; surgical removal of part of the intestine (e.g. to treat Crohn’s disease); and the side-effects of certain medications. Some vitamin B12 is stored in the liver, but this supply is enough to last only three to five years. If the store is not replenished, B12 deficiency symptoms will develop. Red blood cells are produced at a rate of millions every minute and are therefore rapidly affected by vitamin B12 deficiency. Reduced numbers of red blood cells leads to anaemia, with symptoms of fatigue, shortness of breath and poor concentration. In pernicious anaemia, symptoms develop slowly over several years and so the diagnosis is often delayed. People who have had severe pernicious anaemia for several years may develop a condition called subacute combined degeneration of the spinal cord. Those affected suffer progressively worsening weakness and loss of feeling in their legs, arms and body, along with impaired vision and loss of muscle control. The effects of subacute combined degeneration of the spinal cord may become permanent if the B12 deficiency is not corrected. The symptoms of vitamin B12 deficiency may be severe, but deficiencies can be treated by a doctor with a course of B12 injections, oral B12 doses, or sublingual vitamin B12 tablets, which are placed under the tongue to dissolve. Vegans who may be at risk of B12 deficiency should take a dietary supplement to avoid any possible problems.